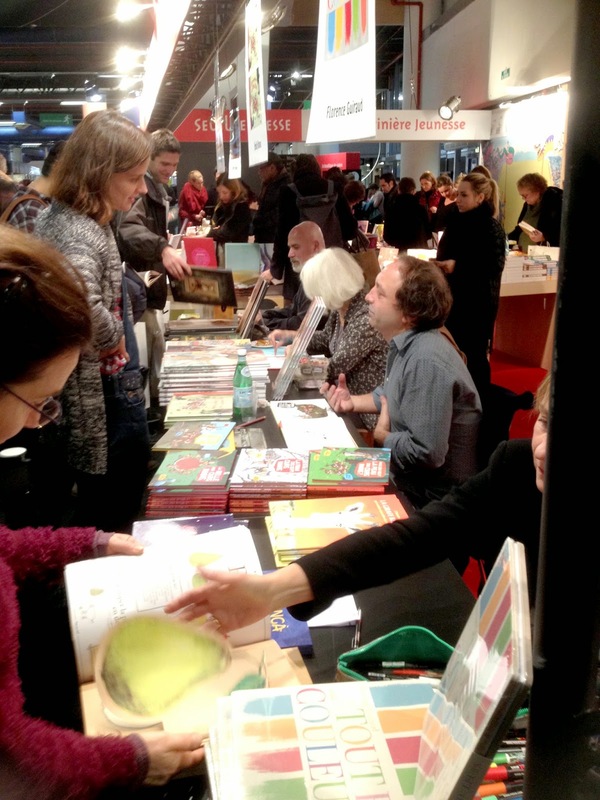 I have enthused more than once before after signing my books at the inspiring treasure trove of books that is the French national children's book fair (the Salon du Livre Jeunesse). What a paradise for lovers of children's books, old and young! Surely it is one of the reasons why French children's publishing thrives. Is there an enterprising someone who could dig out a nice big exhibition space and rally British children's publishers here to create the equivalent - a national 'selling' fair for the UK children's book market? It would be such a big boost for the UK publishing industry, bookshops included. 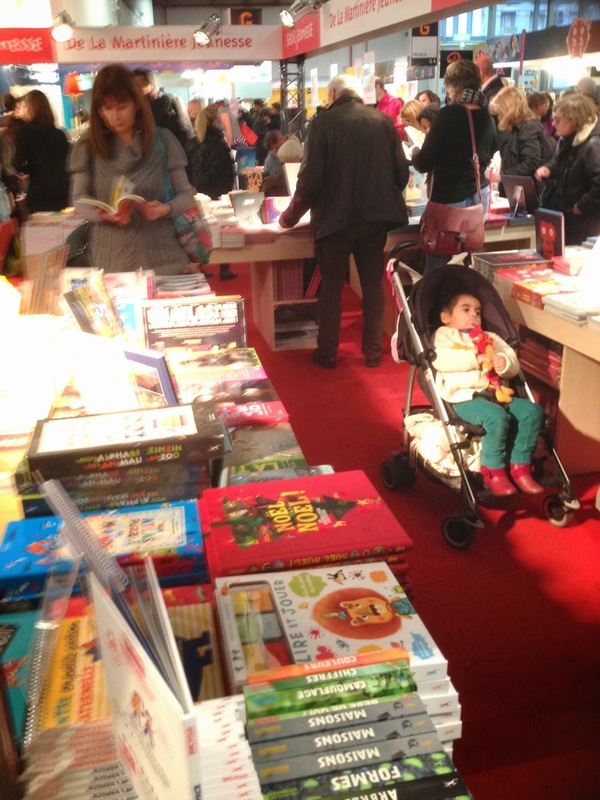 French publishers at the Montreuil work with different independent bookshops who run the sales tills at each of their stands at the book fair. 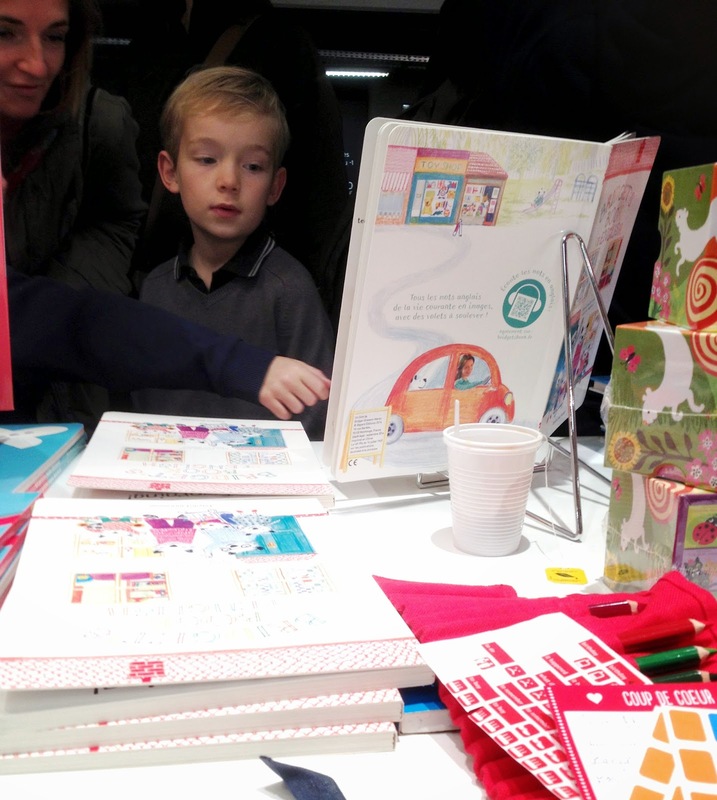 The point is that unlike at the London Book Fair, publishers could actually sell books (and apps and a few related products) directly to parents and children of all ages (babies too!) school groups (in France they come in their droves to visit the fair, sometimes with special book tokens to spend) as well as teachers, librarians, book lovers and art students, not to mention us authors and illustrators. Here's my illustrator's eye view from the Bayard stand, as armed with coloured pencils and stickers I got ready to sign my new book, Bridget's Book of English (That's the title my French publishers chose). 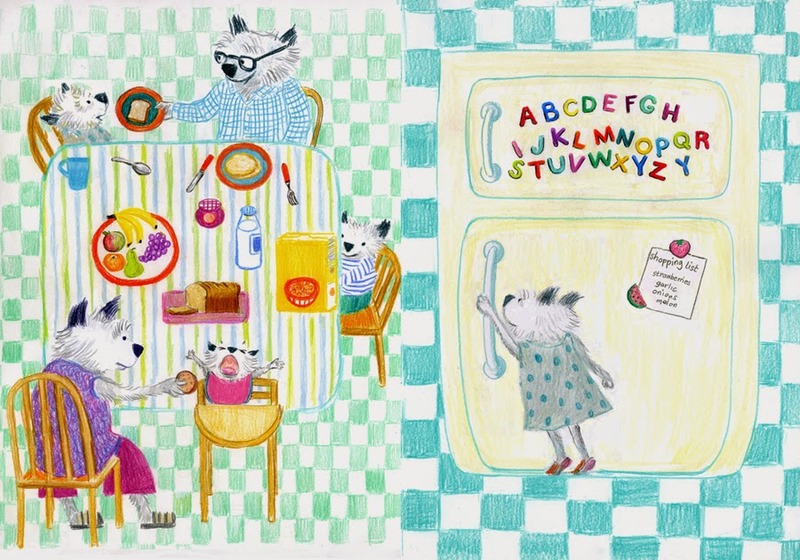 It's a large board book full of flaps and details - and English words - showing a funny furry family going through their day. On the back is a QR code and link to a site where I pronounce every word online - and be warned - I even sing the few songs in the the book. How to sign a big shiny board book? Well I did a drawing on sticky-backed paper, stuck it onto the door on the right here alongside the name of the child and my signature. Regis Faller, the creator of Polo, was signing just to my left. Polo is the adventurous dog whose exploits feature in brilliant wordless comic books for pre-readers. Polo is a big success in France and also won a prize in the US. 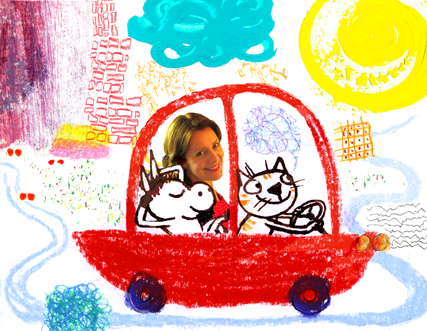 I told Regis that I was lucky enough to witness our Bayard editor Isabelle Bézard presenting it at our SCBWI Bologna conference some years back and as a result the great editor Neal Porter, of Roaring Brook bought the US rights for Polo. ...has just been reprinted with a new cover in France. So I signed this book too. 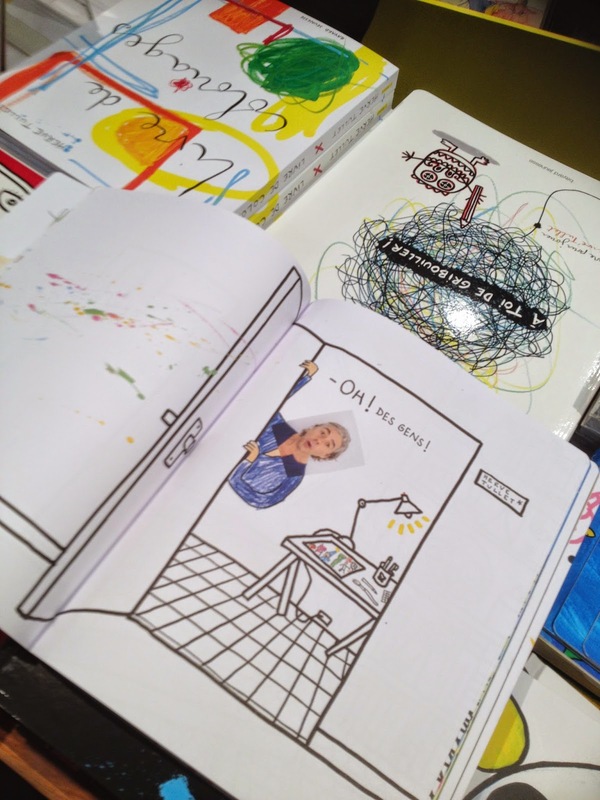 Oh - here is Hervé - in one of his books! Pity this is the only caught glimpse I caught of him at the fair. 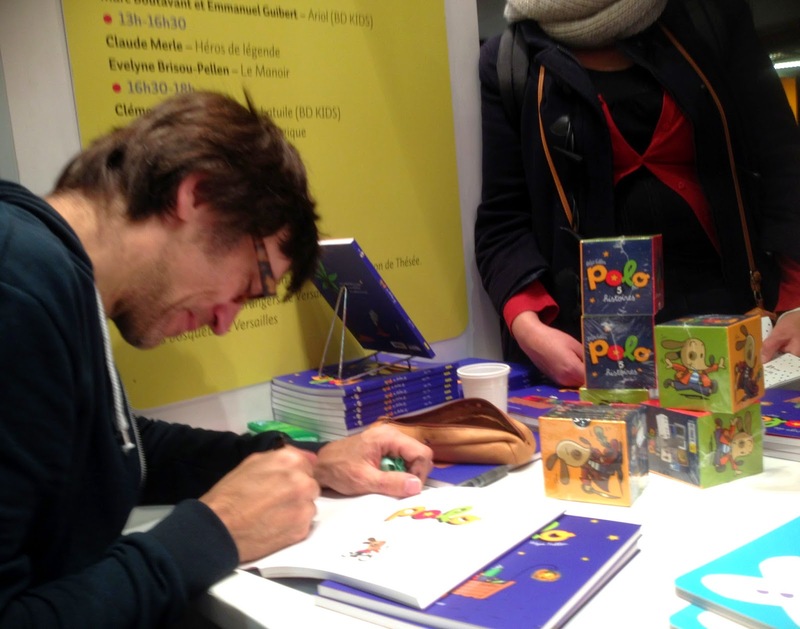 Authors and illustrators were kept busy everywhere - including comic artist Emile Bravo (I love his Trois Ours Nains series) in the middle here signing at the Seuil stand. Art, doodles and drawing books were everywhere too this year - in books and on backcloths. 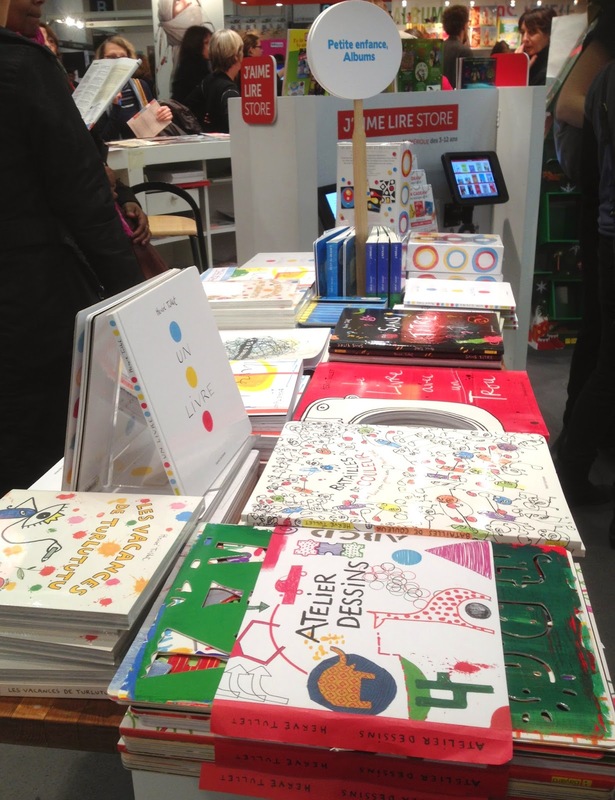 Above is the Sarbacane stand which published one of my favourite books this year by Serge Bloch. Wow- was the fair busy! 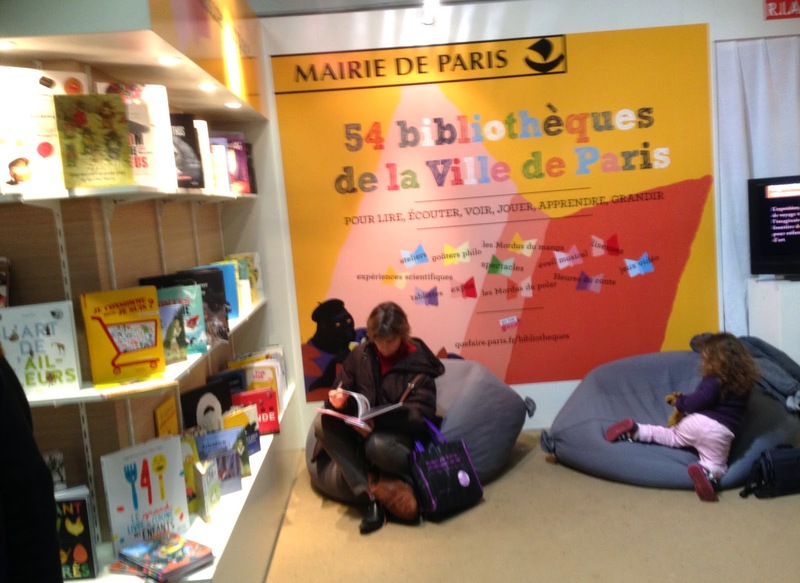 Nice that the Paris libraries had a suitably quiet corner stand of their own for kids and adults to relax in and browse. Monday, the last day is the 'professional' day, when more adults attend than kids. I wonder how many of the people here with their noses buried in books, are teachers and librarians buying their stock for the year. Ouch! My Iphone battery went flat too soon and I missed taking a photo of my other friend Marc Boutavant who was signing all over the place. Queues for him were huge so I will have to wait to get my latest Marc Boutavant treasures signed when I see him for another fun dinner chez lui or hey - let's get him to London. But more about that next post!